CENTENARY — The second annual Gallia Academy High School Career Fair for seniors was a success on Wednesday morning. 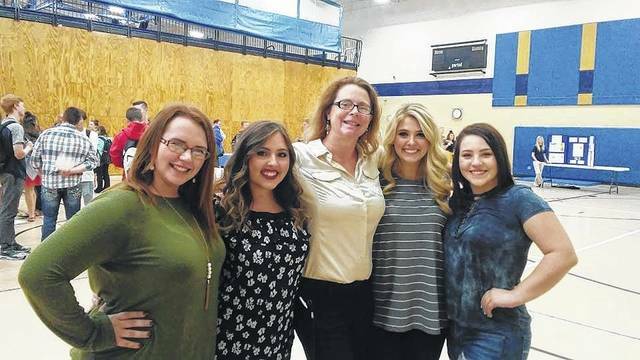 Local businesses from the area came together under the coordination of Sandra Mayes to help educate seniors about making life choices after high school. Many of the local businesses promoted career paths that don’t require a traditional four year degree program. Altec, a diesel and truck maintenance company was present to expose students to the possibility of being a mechanic. “It’s good to have people and professions where you don’t have to have a four year degree,” stated Mayes. She also explained the importance for students to go into a variety of fields. “I tell the students, if that is something you want to do, pursue it. Two year or four year training; I don’t care. Ask the questions, make the plan, it’s your life, but make sure you ask the questions and make the plan,” said Mayes. She also discussed the stigma around educational programs under four years and how misplaced that stigma is. “They are just as important, and those with two year degrees are sometimes even more important,” stated Mayes. Many of the businesses came with work place skills expectations. Students were told about proper time management, being efficient while they’re working, and using time wisely, including proper use of cell phones. Two separate students took initiative to create opportunities for job shadowing. According to Mayes, these students reached out to these business owners to learn more about those career paths. “When the kids take ownership of their lives, they get real excited, and I get excited for them,” said Mayes. Many of the businesses that came out are from Gallia and surrounding counties, and donated their time to invest in students futures. “I appreciate all of the time given to our students by our speakers because they are not paid by the school to be here,” said Mayes. Brianne Birchfield (left) and Tori Corvin (right) are pictured with a representative from the United States Marine Corps. The United States Army was also represented. Several students from the newly forming Leo Club with Sandra Mayes, coordinator for the career fair. From left, Lexi Taylor, Brianna Sanders, Sandra Mayes, Ellie Rose, and Makena Saunders. These students helped set up the event.